This recipe for Zucchini Potato Gratin has become a great side dish over this summer and doesn’t just have to be eaten when grilling as it will go with just about anything. A good friend of ours Red, sends us every few months a copy of Southern Living magazine and for those of you that have heard of this publication will know that it is stacked with great articles and fantastic tasty recipes. There was an article in the summer edition where we found this recipe about a Austin, Texas and a mention of a guy named Aaron Franklin who owns Franklin Barbecue. Now I am just starting to get into all the smoking ribs and stuff so found this interesting and to note that he was an old friend of the owner of my fave Mexican restaurant here Maria Bonita . Anway thumbing through the magazine, my wife found this recipe for Zucchini Potato Gratin and thought we should try it out as we grill often, weather permitting and it’s always nice to have alternative side dishes other than baked or boiled potatoes and of course if you have ever been to a grill party at a German household you will know that the menu is nearly always the same no matter where you go. 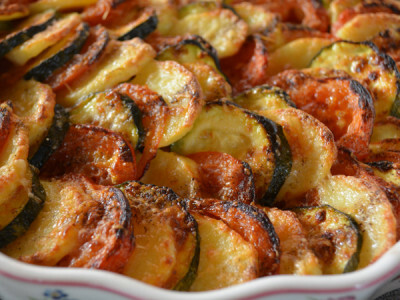 So We like to pep things up a bit and as always our guests are overwhelmed by our offerings this recipe for Zucchini Potato Gratin was a success. On to the recipe then. Preheat your oven to 375°f, 190°c or gas mark 5 and in a pan over medium heat melt the 2 tbsp. butter, then add the onions and fry for about 10 to 12 minutes or until tender and golden. Spoon the onions into a 10-inch quiche dish or casserole dish coated with cooking spray. Toss together the potatoes, zucchini (courgette) and tomatoes and season with the salt, black pepper and thyme. When well seasoned place the potatoes, zucchini and tomatoes in a single layer over onions, alternating and overlapping slightly. Drizzle with the 2 tbsp of olive oil, cover with aluminum foil and bake for 30 minutes. Remove the foil and sprinkle with the Parmesan cheese. Bake 35 to 40 minutes or until golden brown. Let stand 10 minutes before serving.